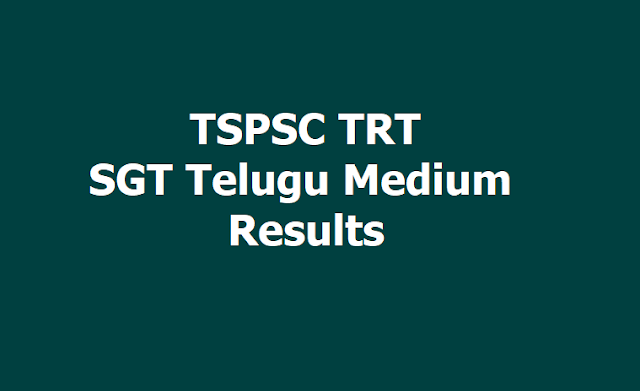 TSPSC TRT SGT Telugu Medium Merit List Results 2019 declared. TSPSC TRT SGT Telugu Medium Results : Provisional Selection List 2019 Released, Provisionally Selected Candidates List of SGT Telugu Medium has been released. TSPSC Conducted the OMR/CBRT Examinations to the Post of Secondary Grade Teacher -Telugu Medium notified vide notification no.53/2017 for a total no. of 3785 vacancies in School Education Department. The candidates have to be provisionally selected for appointment to the post of Secondary Grade Teacher-Telugu medium vide notification no.53/2017 dated 21.10.2017. TSPSC Web Note: TSPSC informed that an Experts’ Committee consisting of 9 academicians was constituted in compliance with the orders of the Hon’ble High Court dt: 21/02/2019 in WP No.27211/2018 and 44467/2018, to re-examine the disputed questions pertaining to the written exam conducted for recruitment to the post of Secondary Grade Teacher (Telugu Medium) vide notification no.53/2017. A meeting was held on 05/03/209 and the disputed questions (14) were referred to the Experts’ Committee. The Experts’ Committee re-examined all the 14 disputed questions (Q.Nos 13, 88, 98, 116, 117, 118, 125, 132, 133, 135, 136, 149, 154 & 160 of Series-A) keeping in view of the material submitted by the petitioners. After thorough examination of the evidences submitted by the petitioners and also by the Commission, on referring the standard / authentic sources, the Committee has resolved that no changes are necessitated and the Corrected Final Key published by the Commission is correct. Therefore the candidates may note that the Corrected Final Key pertaining to Secondary Grade Teacher (Telugu Medium), vide notification no.53/2017 which was published by the TSPSC on the website www.tspsc.gov.in on 29/05/2018 holds good. The Commission is making all he efforts to complete Medical Board verification for PH candidates by the end of March, so that results for Secondary Grade Teacher (Telugu Medium), vide notification no.53/2017 can be released during the 1st week of April 2019.